Following the success of the CD “CATHY’S SUMMER” featuring many new Darius Brubeck compositions, The Darius Brubeck Quartet will be again offering new music and a new recording in 2016. The concerts usually include standard and South African jazz and ever-popular Dave Brubeck music too. Dave O’Higgins with his great range of feeling and skill excels playing this varied repertoire with the rhythm trio of Darius, Matt and Wes, who have been together for 10 years. Their mutual understanding and interaction is always a pleasure to see and hear. Playing to sold-out houses at regional festivals and clubs, including London’s Ronnie Scott’s, their acoustic sound is melodic, spontaneous, rhythmic and engaging. In the second half of 2015, the quartet played in Germany and Ireland and was featured on BBC’s “Jazz Line” live at the Edinburgh Festival. Reviewing the group in JAZZ JOURNAL at the Llandudno Jazz Festival on August 03, 2015, Brian Payne writes “Darius Brubeck ….was professional to a tee. Once he was satisfied (with the sound) the band was off like a rocket. 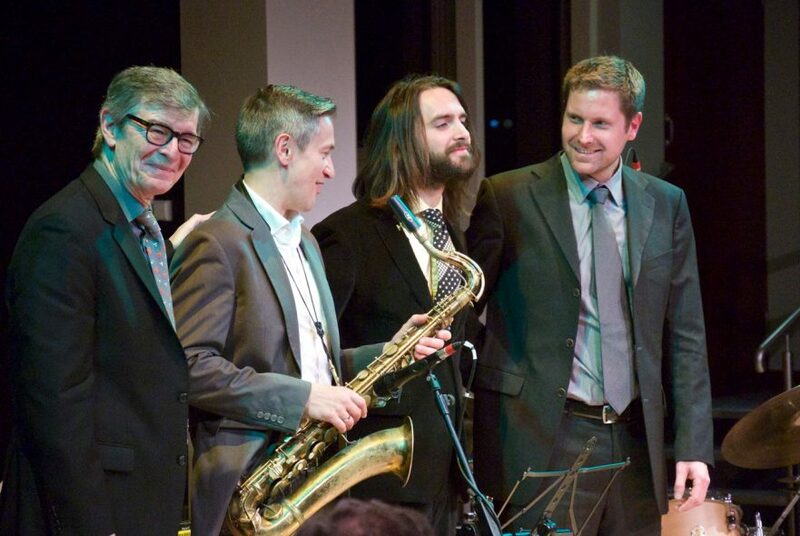 With Dave O’Higgins on sax, the excellent Matt Ridley on double bass and Wesley Gibbens driving the drums, they took the audience on a flawless ride through a catalogue of original compositions and Dave Brubeck back numbers.